CITY HALL — An excavation at the city’s political center has unearthed a 3-inch artifact that initially baffled archaeologists — until they realized it was one of the earliest documented feminine hygiene products in New York. 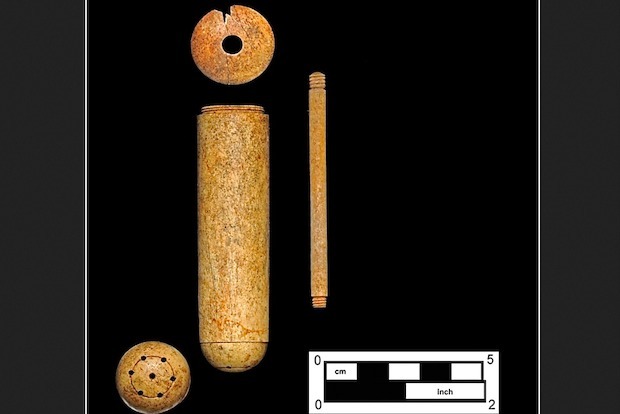 The early incarnation of a douche — a hollow, cylinder with small holes at its top made from unidentified mammal bone — was found in a massive heap of buried garbage that dates back to between 1803 and 1815, Loorya said. The centuries-old trash, in a pile found three feet underground and extending to a depth of about six feet was also filled with liquor bottles and various items associated with food waste, suggesting it may have all came from one celebratory event, Loorya said. The team was long confounded by the late 2010 discovery on the north side of City Hall, until archaeologist Lisa Geiger made a fortuitous find. The discovery drove Geiger, an anthropology masters student at Hunter College, deep into research about the unusual topic of the early years of douching — a practice that has long since gone out of favor in the medical community. After months of research, Geiger presented her findings at Society for Historical Archaeology Conference in January. The modern version of the douche first started appearing in America and Europe in the early 1800s, part of what was a misguided way to treat women’s issues including menstrual cramps and venereal disease, Geiger said. “Those solutions they were injecting with these vaginal syringes did affect their reproductive systems, but in a negative way, and that may possibly have helped decrease pregnancy,” Geiger added. While the douche discovery is a first for the Chrysalis team, they've found thousands of other artifacts in Lower Manhattan while overseeing numerous city projects, including, in August, a trove of 18th-century liquor bottles. "Other archaeologists were pretty interested in the findings," Geiger said of the find. "There isn't a huge amount of research on the topic, even though it was apparently [a] very common practice in the 19th century — people still don't know what they are when they find them in digs." The team found also found a second douche, but it wasn't completely intact. The artifacts are currently in storage. "In New York, it's been documented that women gave them as wedding presents to each other," Geiger added. "Several later versions were found in digs near brothels in New York [near the former Five Points neighborhood] more than 15 years ago — but whether you were a prostitute, or upper class, it seems women across economic and social lines were using them."